Stefani Pentiuk Thompson and Alyssa Sandeen have been Mayo patients since childhood, each needing a heart transplant and then a kidney transplant. Until this summer, their paths had never crossed. Side-by-side, the parallels are uncanny. First heart transplant before the age of 10? Check. Secondary kidney transplant, each with their mom as the living donor? Check. More medical tests, procedures and follow-up appointments during the past two decades than either cares to think about? Check. 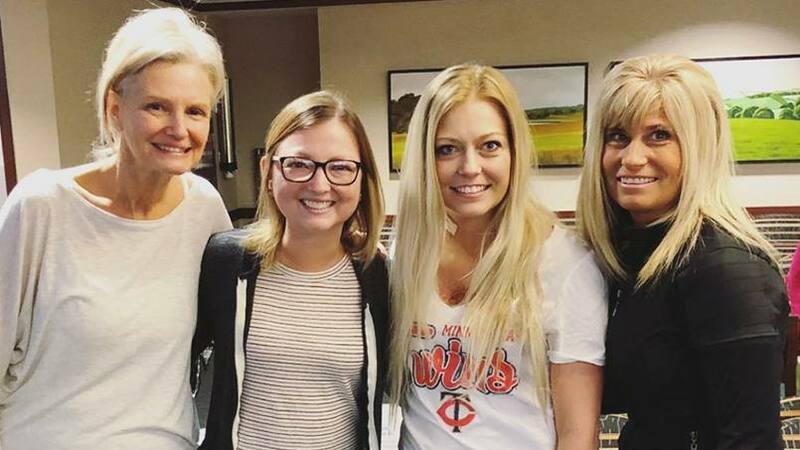 Despite having all of this in common and sharing many of the same care team members at Mayo Clinic's Rochester campus, Stefani Pentiuk Thompson and Alyssa Sandeen had never met face-to-face. That is, until they happened to run into each other in Rochester earlier this summer. Stefani tells us she had been following Alyssa's journey on her CaringBridge page "and just sort of cheering her on from a distance for years." Then one day after a cardiology appointment, Stefani recognized Alyssa and her mom, Lisa, sitting in the lobby at Mayo. "Even though I'm normally a reserved person, I was like, 'I've wanted to meet this girl for so long; I have to go talk to her,'" Stefani tells us. So she did. "I walked up to them and said, 'Hi, you probably don't know me, but my name is Stefani and I'm just so excited to finally meet you,'" Stefani says. "It was just so nice to finally meet her and share stories with her and her mom." As it turns out, it wasn't the first time Stefani's parents, who were with her for that appointment, had met Alyssa and her mom, who was accompanying Alyssa. "My husband Perry and I first met them back in 1999 when everything was first starting to fail with Stefani," Stefani's mom, Heidi Pentiuk, tells us. "At the time, I had no concept of what a heart transplant would mean for her, or for the rest of her life." Sensing that fear, a member of Stefani's care team approached Heidi and suggested she meet Alyssa. "She'd had a heart transplant at Mayo a year before and was there at the same time as us," Heidi says. Heidi tells us it was that meeting that helped put everything into perspective for her. "As soon as I saw Alyssa, everything changed for me because I saw this little girl who still looked and acted like a normal little girl," Heidi says. "It was just the best thing I could have seen at that time, and so when Dr. [Joseph] Dearani told us a little while later that they'd found a new heart for Stefani, I said, 'Yes. Let's do this. Let's absolutely do this.'" Today, nearly 20 years later, Stefani's heart is still going strong. Both she and Heidi say that's in part thanks to the comfort and inspiration they received from Alyssa and her family all those years ago. "Honestly, it means the world to me to hear that," Alyssa tells us. "Because that's really what I want to do now — inspire people and let them know that they can get through anything. And it's nice to know I've been able to do that. It's also nice to know there's someone else out there who's going through similar things." And, it seems, doing similar things: Both Alyssa and Stefani are now working in the health care field and also doing what they can to promote the importance of organ donation. "I can't tell you how important that is," Alyssa says. You can read more about Stefani here, and Alyssa here and here. Then give us something to read by sharing your comments below before using the social media tools atop this page to share this story with others.